A hat slightly obscuring your face, lying like a sun-goddess on your clicky bed. 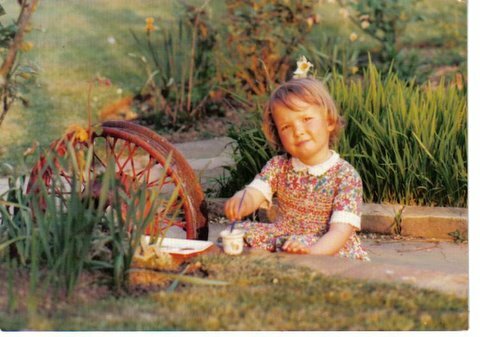 I sat next to you, making daisy chains, playing with my imaginary friends – they were real to me of course. My sisters were off exploring in the woods, building a camp or dam in the stream. You wanted me to stay with you, I was too little. You were always brown, always healthy looking, always beautiful. I sat on the clicky bed next to you, just looking, I think I did that alot. You said “Holly darling, will you draw me a lovely picture?” Of course I would, I’d do just about anything you asked me. A cunning diversion technique so you could continue sun-bathing. I see that now of course. The sun started to go down then and we were all called in for supper, my sisters from whatever adventure they’d had, me from my own little world. We pestered you to let us eat our supper in the field beyond our garden. Don’t know why, I just know my sisters wanted to, so of course I did too. They were my big sisters. They always had good ideas. You let us. We sat on a tree trunk fallen in some ancient storm and ate chicken & ham pies. Later when the midges started biting and the dew was falling we ran around outside in our pyjamas. I was called in first of course. Being the youngest. I don’t recall if I resisted or not, but I expect not. You were my mummy, bedtime meant cuddles and stories and precious time with you. In my mind it was eternal summer at our cottage in Sussex. You were always sunbathing, I was always playing, my sisters were always exploring. Mostly we all played together, but sometimes I’d just be with you. The best place to be. I go back there sometimes, in my mind. The happiest days of my life. Inspired by Josie’s workshop, the prompt was ‘Summer’. Oh this was magical!! What a lovely endless summer in your mind. This reminds me of fine English writing (speaking as an American). I love it. I love the observations of the little girl as told be the adult woman. I wonder what your daughters will write about you one day. Tears here. That was so beautiful and real. Love the clicky bed. Love “You were my mummy, bedtime meant cuddles and stories and precious time with you.” Those moments are so precious. I can see why you revisit this. It does sound like a lovely place to be. Utterly beautiful. My mum is 81 and I would be lost without her, your post brought back such similar memories to me. My mum was also always so brown, a real sun worshipper. That was one beautifully written post. Cherished times indeed. Your mum sounds lovely, what idyllic summers. Funny how we remember the sunny days. Or maybe it was sunnier back then!